Bakkies Botha has spoken of the determination in the Springbok camp ahead of their vital Tri-Nations showdown with the All Blacks in Hamilton on Saturday. The Springbok lock believes that last-season's 30-28 win at Carisbrook has given the squad the belief to win on New Zealand soil, even with the pressure on. A 21-6 defeat to Australia in Brisbane last weekend has threatened to derail the Springboks' Tri-Nations campaign with the All Blacks sensing an unlikely comeback with two Tests at home left to play. Graham Henry's men are currently nine points behind the Boks with a game in hand, but Botha is confident that his team-mates can get the job done at Waikato Stadium. "That win in Dunedin last year broke the ice, it's planted a small seed in our minds," he said. "You tell yourself 'you can do it in New Zealand'. At the end whistle in Dunedin, it was such an amazing feeling and the guys want that again. "We weren't at 100% last weekend, if you compare the intensity of Brisbane with the intensity we brought in Perth, then you can see it just wasn't there. But we know what we lacked, and it's a final for me this weekend. We know what we have to do, everyone just needs to buy in now, and then we need to go and produce the goods in Hamilton. "We all know we can seal the Tri-Nations, but the main goal for the team is to focus on what we need to do and back our systems." The Springboks defeated the All Blacks twice on home soil earlier in the series, but Botha is expecting a fired-up response from the defending champions. "Playing at Hamilton, at home, in front of their own crowd, they're going to be more up for it," said Botha, who will win his 63rd cap this weekend. "They've had three weeks off and the time to get together and refocus. "Tests against the All Blacks are always a tough task and if we're not at 100%, then it's going to be a long day for us." Coach Peter de Villiers has delayed naming his team for the game after injuries hit the squad in the form of Bryan Habana and Pierre Spies. Winger Habana had to be taken off the field before half-time in Brisbane due to a hamstring injury, while number eight Spies picked up a groin problem. 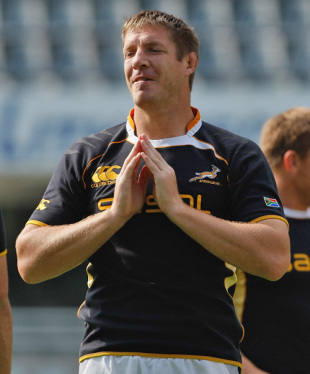 The Springboks have already lost lock Andries Bekker and winger JP Pietersen during the tour.